StudioCoast support a variety of DNS records that can be added and edited via the hostControl panel. These include A, MX, CNAME, SRV and TXT records. Below is basic description for what each of these are. An "A" record allows you to point your domain name to a website. Or more specifically, to the server that the website is hosted on. Value: The priority number then a space followed by the mail server address. An MX record also requires a full stop on the end which will be added automatically. StudioCoast have multiple mail servers and they differ between accounts. To check what mail server you are on, log into hostControl and then select the "Email Accounts" menu item under the General section. Then click the 'Connect Info' link to the right of an email account. 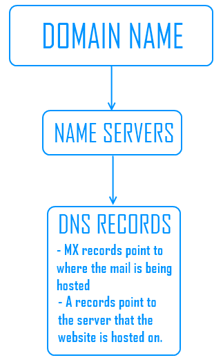 An "MX" record allows you to point your domain name to email hosting. A "CNAME" record is used to create an alias for a subdomain to another domain or subdomain. For example, you may want to create an alias for mail.domainname.com to point to your mail server address such as moon.studiocoast.com.au so it is easy for you to remember when you browse to webmail in your browser or enter it into your email program's mail server settings. Value: The domain name or subdomain address you wish to make it an alias to. A "TXT" record is for more advanced DNS entries and provides text information to sources outside your domain. The text can be either human-or machine-readable and can be used for a variety of purposes. One use for a TXT record is to add an SPF record. Value: The value for the TXT record (this will differ depending on what it is for). A TXT record must always be inside quotation marks. A "SRV" record is for more advanced DNS entries and provides the ability to allow specific services to be directed to a separate location. One example is an autodiscover entry. The below example creates an autodiscover SRV record that works with our hosting. This allows you to setup an POP email account in Outlook using the automatic method. It will look for the autodiscover DNS entry and pull the information from the value's service.